It provides relief from symptoms associated with sinus, allergies, colds, or the flu. 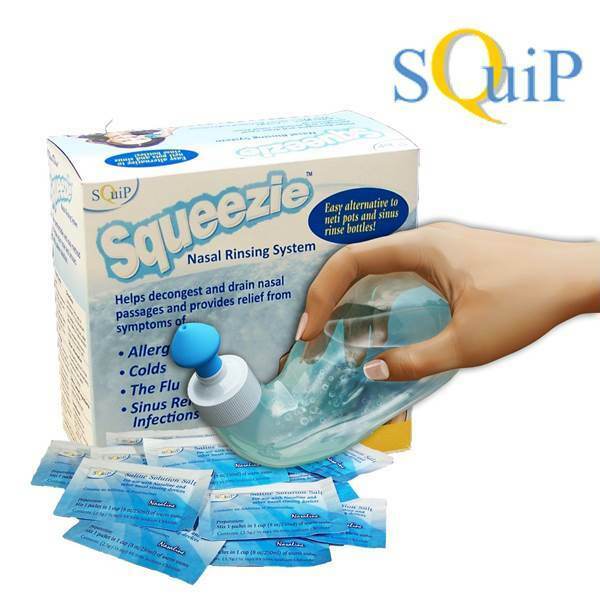 After a prolonged stay in dry, dusty, or smoky environments, Squeezie cleans and soothes the nasal passages, reducing nasal irritation and moistening the mucous membranes. Nasaline was invented by a team of Swedish ear, nose, and throat specialists. Working with sinus patients over the years, these specialists recognized a need for a nasal irrigation device that was effective, easy to use, and affordable. For additional information or if you have any questions or comments for the entrepreneurs, please visit their European web site at www.entpro.com. Made of super flexible material for “single-squeeze” action with minimal pressure required. Grip friendly design ensures proper positioning of head and neck to achieve great rinsing results. Easy to clean to prevent bacterial buildup. Made of medical grade silicone for a soft touch to the nose. Designed to fit all noses - kids too! 1. Empty 1 packet (1/2 teaspoon) of Squip Salt into the Squeezie bottle. 2. Fill Squeezie bottle with 8 oz./250ml (up to “Fill Line”) of warm *water - tightly screw on cap with tip - shake to properly mix the solution. 3. Stand (or sit) over a bathroom sink or use in the shower. 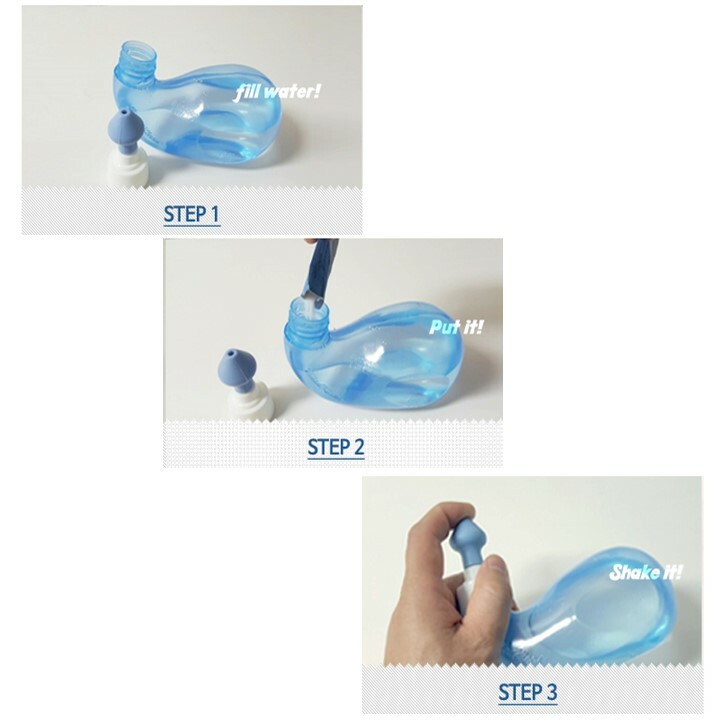 Put the silicone tip against the nose so that it completely seals the nostril. Breathe normally through the mouth (or say aaaah...) and gently squeeze the bottle. Refrain from swallowing... ... when the saline solution reaches the back of the nasal cavities, the palate closes automatically by reflex. The saline fills the nasal cavities and proceeds to pour out the other nostril. 4. Perform this process twice in each nostril. Use a tissue to blow out any remaining saline in your nose. Some of the saline can remain in the nose and trickle out later. Tilting your head forward and turning side to side immediately after flushing can prevent this. 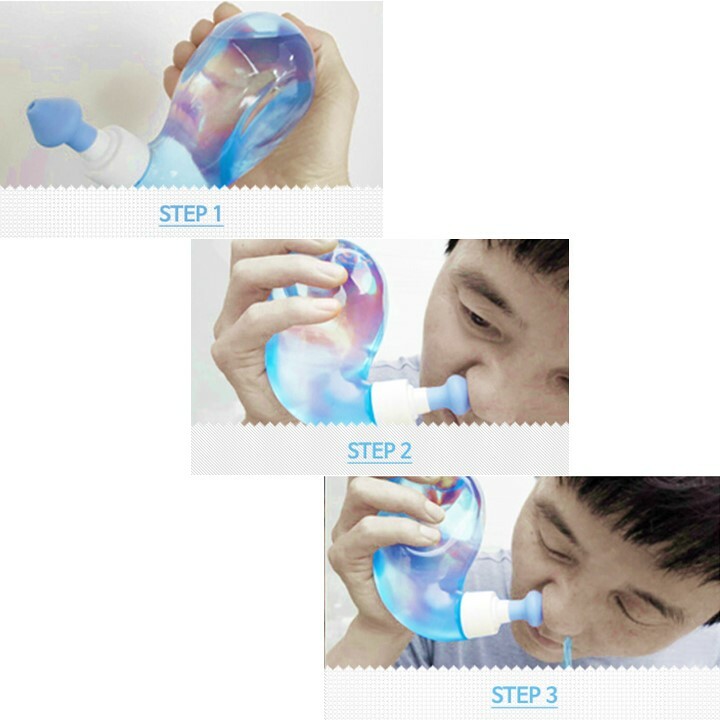 Use one full bottle (8oz/250 ml) in each nostril per rinsing session. Rinse once or twice daily or as recommended by your doctor. Remove the tip, unscrew the cap, flush all three parts (bottle, cap, tip) with soap and warm water – let air dry. Store in dry place. With frequent use, the NäsaKleen Squeezie unit should be replaced every 6-8 months for hygienic reasons. Use distilled or sterilized water. The saline solution should be at or close to body temperature. Once mixed, use the saline solution within 24 hours or discard. The saline solution has the same salt content as the human body (0.9%) - this is called a physiological (or isotonic) saline solution. The proper salt/water ratio of the saline solution is VERY IMPORTANT! If too much salt is used (hypertonic), slight stinging may be felt. 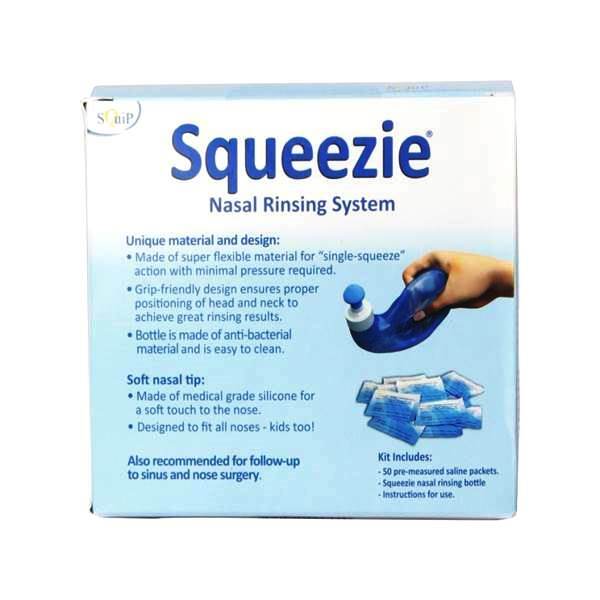 In some cases this may be desirable in order to shrink/reduce the swelling of the mucous membranes - but this may also dry them out if used for an extended period of time. If less than the prescribed amount of salt is used (hypotonic), a stinging sensation may also be felt and it may swell the mucous membranes. This is not desirable, as you may feel somewhat more congested than you did prior to rinsing. Nasaline Salt does not contain any additives or preservatives. We do not recommend using regular iodized table salt as the iodine may cause allergic reactions. We also do not recommend using sea salt which may contain algae or pollen. Can I use the NäsaKleen Squeezie if I am pregnant or breastfeeding? 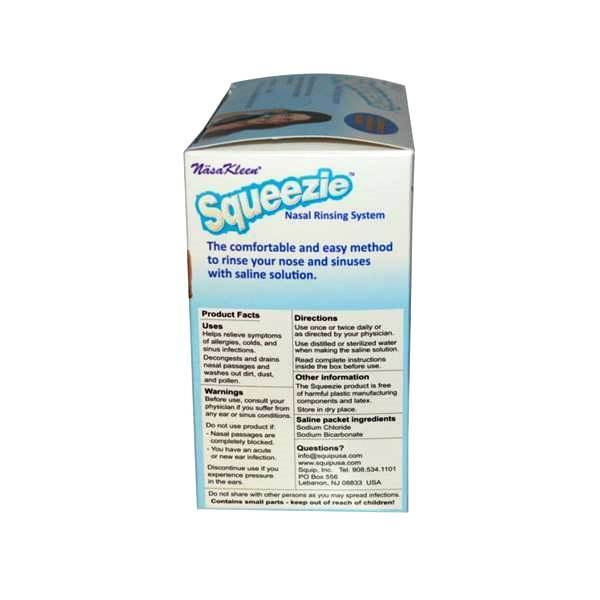 The NäsaKleen Squeezie can be used during pregnancy and breastfeeding. In fact, since pregnant women should not be taking drugs for pregnancy congestion, nasal irrigation with saline solution is considered one of the best healthy natural alternatives to many over the counter and prescription drugs. Are there any side effects to using the NäsaKleen Squeezie? There are no known side effects. Who can use NäsaKleen Squeezie? 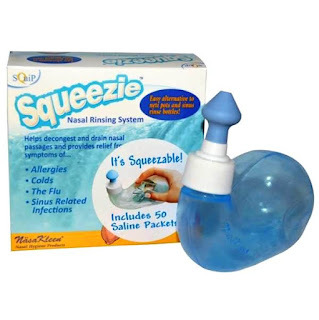 Anyone 4 years old or older can use Squeezie, however, children from age 4 to age 12 should not use Squeezie without parent supervision. For newborns or toddlers, we recommend Baby NäsaKleen - The Nasal Aspirator. How often should I replace my NäsaKleen Squeezie? When making the saline solution, why is the salt-to-water ratio so important? The saline solution has the same salt content as the human body (0.9%) - this is called a physiological (or isotonic) saline solution. Note: The proper salt/water ratio of the saline solution is VERY IMPORTANT! If too much salt is used (hypertonic), slight stinging may be felt. In some cases this may be desirable in order to shrink/reduce the swelling of the mucous membranes - but this may also dry them out if used for an extended period of time. If less than the prescribed amount of salt is used (hypotonic), a stinging sensation may also be felt and it may swell the mucous membranes. This is not desirable, as you may feel somewhat more congested than you did prior to rinsing. What type of water should I use? Use distilled or sterilized water. The saline solution should be at or close to body temperature. Once mixed, use the saline solution within 24 hours or discard. Can I use ordinary table salt or where do I obtain saline solution? You can use ordinary salt, but if you are planning to use the NäsaKleen Squeezie for an extended period of time, you should use salt that is non-iodized and free of preservatives or anti-caking agents. We recommend using Nasaline salt, which is free of additives such as iodine or anti-caking agents. Iodine or additives such as anti-caking agents have been known to produce allergic reactions. Can I use sea salt to irrigate my nasal passages? Although typically safe for eating, sea salts are generally not clean and should not be used for nasal irrigation. Some sea salts have been known to contain algae - which could result in allergic reactions. Is NäsaKleen Squeezie made of safe materials? 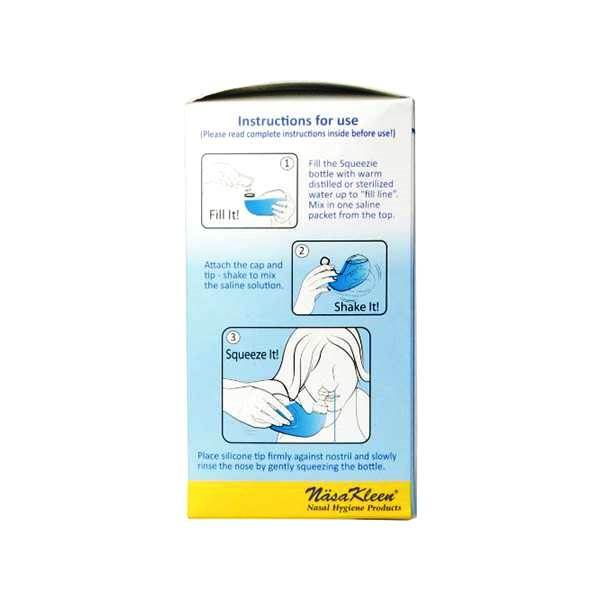 Yes, the ENTIRE NäsaKleen Squeezie is latex-free and completely safe as it was specifically designed for direct contact with the skin. How often can I use the NäsaKleen Squeezie? Rinse once or twice daily or as recommended by your doctor. How should I clean the NäsaKleen Squeezie? Where and how should I store the NäsaKleen Squeezie? The NäsaKleen Squeezie should be stored in a dry environment at room temperature. The Nasaline product is entirely latex-free. Nasal passages are completely blocked. You currently have an ear infection. You have had prior sinus or ear surgery. Use distilled or sterilized water. Once mixed, use the saline solution within 24 hours or discard. If you experience pressure in the ears or any discomfort, discontinue use and contact your physician. Caution: Rinsing with PLAIN WATER (without salt) will result in a severe burning sensation! Do not rinse with hot water or you may burn yourself! Do not share product with other persons as you may spread infections.